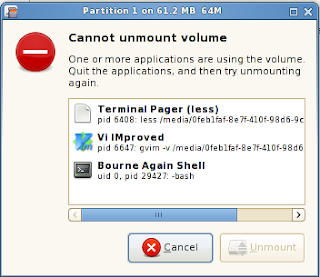 Many people criticize Gnome for being behind the times and slow to change. Being the default desktop environment of Ubuntu, Gnome’s usability is quite important, so this criticism should not be taken lightly. However in this post and the next I would like to demonstrate that Gnome is moving forward in terms of usability in multiple important (and in some cases exciting!) ways. My disclaimer here is that some of these concepts and mockups are taken from bug reports and developer mailing lists, and may not necessarily be the end result of the development. As such, not all of these features may make it into Gnome 2.24 (Intrepid); I will try to note when to expect each feature. The old dialog. Not particularly helpful. One mockup of a proposed dialog. Note that the Unmount option will be enabled once all the applications are closed. This should make using devices like USB drives much more friendly to beginning users, especially users coming from Windows where this explicit unmounting isn’t typically necessary. The option to have a button to kill unresponsive applications is also being discussed, which I think could be very useful. I would suggest looking for this in Intrepid+1 if not Intrepid. For more information look at http://bugzilla.gnome.org/show_bug.cgi?id=528559 and it’s downstream Ubuntu bug. Currently users of metacity are unable to have individual backgrounds for each workspace that they may have (although this can be accomplished, albeit in a not particularly standards-friendly way, with Compiz). This will be an exciting and welcome addition, as the upstream bug is over 7 years old! This will also improve usability for users of multiple desktops by providing more obvious visual cues as to which desktop the user is currently in. There have already been numerous mentions of this online, so I won’t dwell on this feature. I would look for this, if it gets completed (the GSoC student’s blog is not particularly active, which may or may not be an indication of progress) in Intrepid+1, and possibly Intrepid. In Part 2 I will cover a bunch of (potentially) upcoming features in Nautilus, which is Gnome’s default file manager. I wanted to keep this section short so that I could group all of the Nautilus-related features together. These will include a much-needed enhancement of the Replace dialog when over-writing files, as well as the implementation of a tabbed Nautilus, and a new multiview (“columns”) layout, and a few more random improvements. See you then, and please leave comments if you have any feedback!